Coconut Peanut Chutney — Kitchenpostcards An easy dip for all meals! Chutneys are a category of food unto themselves in the Indian subcontinent. When writing in English the easiest category to club them in is Dips. That isn’t entirely wrong. Many chutneys are dip-like. But there are a whole lot of them that could be anywhere on the scale between a chunky relish with uncooked ingredients to a mid-scale compote like cooked chutney and on the other end of the scale akin to a smooth, creamy sauce. This Coconut Peanut Chutney is in keeping with the tradition of coconut chutneys, slightly chunky and a blend of partially cooked and fresh ingredients. The end result is well-balanced chutney that you wont want to waste – and I mean you will lick your fingers clean! What is the role of a chutney in an Indian meal? A chutney is in essence a condiment that helps add an extra layer of flavour to food. Often times chutneys are either sour or some combination of sour, sweet and savory that makes them work as palate cleansers between bites. Thus, enhancing the flavour of the main course. Did you know – foods can be inherently cool or hot? Chutneys across India are made from a wide variety of fruits, herbs and vegetables. 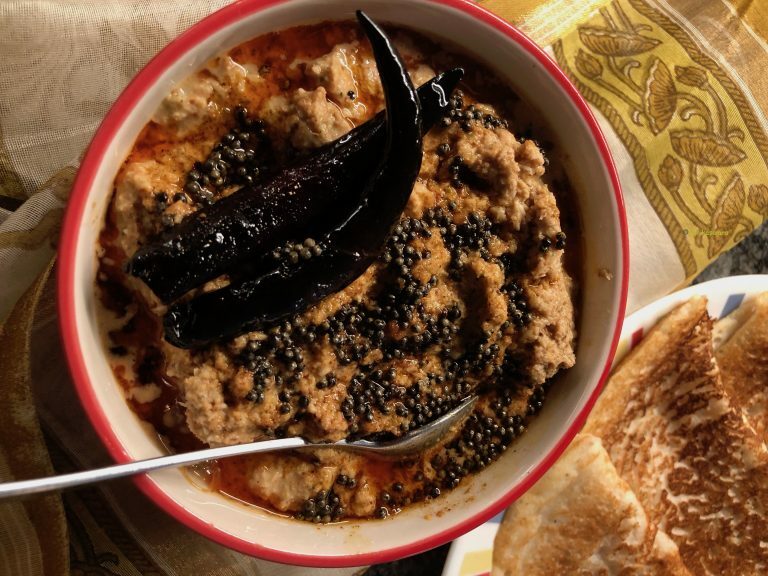 According to Ayurveda (this is from various sources and wisdom passed on from granny) each food has a certain quality called taseer in Urdu (we’ve written about it on the blog before) – of being inherently warm or cool. The ingredients used in a recipe for chutney or other items determine whether the end product will be suitable to the weather. For instance, in the summer months mint and coriander are available in plenty. The inherent quality or taseer of these two herbs is one of coolness. As a result they are used with abandon to make chutneys – either in combination or by themselves. On the other hand ingredients such as sesame seeds, peanuts, cashews are thought to have a warmer taseer and hence ideal for winter snacking. Following from this it is natural to wonder if combining peanuts and coconut will result in a chutney with a warm, cool or lukewarm taseer? Just as opposites attract in the world of human emotions, so they do in the culinary world. In fact it is common in Indian cooking to throw together disparate ingredients and make them sing like a symphony. The warm ones such as sesame seeds, peanuts and other nuts balance ingredients such as coconut, yogurt, mint, coriander, tomatoes and others which have a cooling effect. All that said, I would recommend that you alter the quantities of sesame seeds and peanuts based on 1) your taste and 2) the time of year. In the summers, try to use more coconut (it is cool in nature) and in the winters use the proportions described below. Another coconut chutney – what’s new? That is right, we’ve shared our recipe for Coconut Coriander chutney in the past. 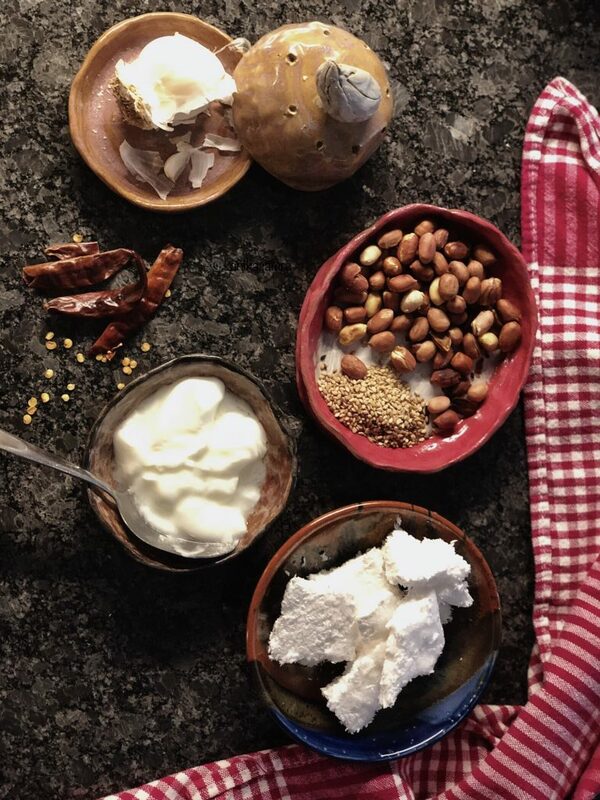 While writing that one we had an on-going debate about different styles of coconut chutney and realized that my method was more akin to the Andhra style of cooking, having spent some time in the city of Hyderabad. One hallmark of Hyderabadi cooking and to some extent Andhra cooking is the abundant use of sesame seeds and peanuts. Andhra Pradesh is an arid and hot state situated on and around the edges of the Deccan Plateau in India. Even then warm foods like nuts are commonly used in recipes because they can actually cool you down. No wonder then Indians eat a lot of spice! I am not sure what ayurveda has to say about this but science points toward triggers, especially due to the presence of capsaicin in chillies and peppers, that leads to sweating and vasodilation, eventually cooling the body. Right now, I can help you by making some lip smacking chutney that will, if nothing else, definitely cool down those hunger pangs! Juice of 1/2 a lime/lemon (optional). 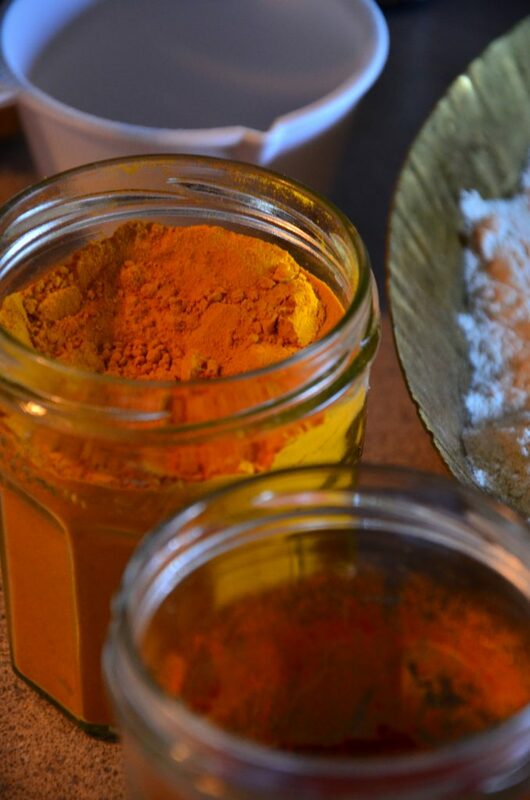 Red Chilli Powder – just a pinch for color. First, measure and collect all the ingredients. Then start by toasting peanuts and sesame seeds. As if they weren’t warm enough, right! Well, it’s the process of dry roasting that really enhances and deepens the nutty flavour of these two ingredients adding that typical Andhra punch to this chutney in addition to all the chilli power to follow. Make sure that neither the peanuts nor sesame seeds burn or blacken. Turn and toss with a spatula until the peanuts and sesame seeds start browning. I use peanuts bought at my local Indian grocery store with the inner skin intact. I highly advise using these because it is the skin that adds both – color and smokiness to the chutney. Next, wash and clean coriander – if using. Peel ginger and garlic. No chopping required. Transfer all ingredients ‘For the Chutney’ to the blender jar and pulse until you get a grainy and thick paste. Using a spatula, while the blender is off, turn and check for any chunky ingredients. Add just a dash of water to help turn things and blend again. User water in small amounts to avoid diluting the chutney. When you are satisfied that all peanuts and ginger, garlic have been ground, put the chutney into a serving bowl (if using right away) or a container that can be sealed air tight. The final piece is the tadka. I like to make my chutney just before serving. Adding tadka on the top works as a garnish that is enticing as well as spicy. Put a small frying pan or skillet on the stove at high heat. Let it warm up. Then reduce heat to medium and add oil. Followed by mustard seeds. Once these are spluttering add curry leaves and whole red chillies. Fry until the chillies start changing color (they deepen in color and turn dark brown). Add a pinch of red chilli powder and turn off the heat. Pour over the chutney and serve. Coconut Peanut Chutney ready to devour! Coconut Peanut Chutney is ready to dig in. Serve it alongside a meal of sambar, dosa, fresh mashed potato sabzi or even idlis and a cup of coffee. If not, then how about a spicy hot chicken curry and some white rice, or, if the heart desires make some dal, rice, potatoes and add dollops of chutney on the side. Sunday done right! 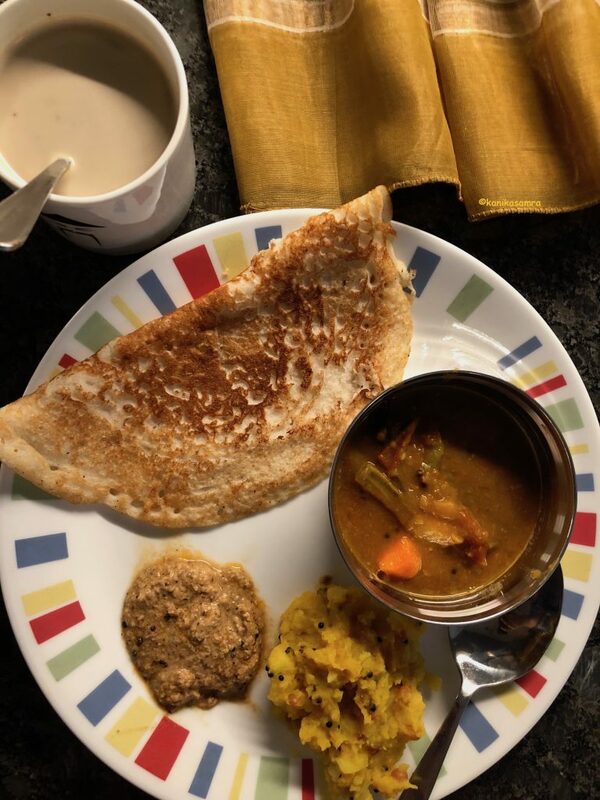 Coconut Peanut chutney with sambar, dosas, sabzi and coffee. Take it from me, it tastes fantastic! The husband and I polished off a batch of this chutney on a sunday afternoon with fresh dosas and potatoes sabzi along with leftover sambar. I washed my meal down with some coffee. A spicy and nutty coconut chutney that is inspired by Andhra cuisine. This simple recipe for a Coconut Peanut Chutney will help you enliven any meal, any day! First, measure and collect all the ingredients. Then start by toasting peanuts and sesame seeds. Turn and toss with a spatula until the peanuts and sesame seeds start browning. Next, wash and clean coriander – if using. Transfer all ingredients ‘For the Chutney’ to the blender jar and pulse until you get a grainy and thick paste. Using a spatula, while the blender is off, turn and check for any chunky ingredients. Add just a dash of water to help turn things and blend again. When you are satisfied that all peanuts and ginger, garlic have been ground, put the chutney into a serving bowl (if using right away) or a container that can be sealed air tight. For the tadka put a pan on the stove at high heat until warm. Reduce to medium and add oil. Then add curry leaves (if using) and chillies. Fry until chillies start browning. Add a pinch of red chilli powder and remove form the stove. Pour over chutney and serve. I use peanuts bought at my local Indian grocery store with the inner skin intact. I highly advise using these because it is the skin that adds both – color and smokiness to the chutney. That’s the grammarian in you! So glad you find it engaging and inspiring – that is the kind of compliment we seek 🙂 As Sakshi’s written it a couple of times and I agree – everyone can and should cook.